If there was any doubt about the No. 1 seed -- and favorite's role -- in Section 2A, Breck put them to rest with a season-ending romp over rival Blake. The Mustangs, who raced out of the gates with 11 straight victories to open the season, had a hiccup or two over the past few weeks (losses to Moorhead, St. Thomas Academy and a stunning 7-4 defeat to Totino-Grace in which Breck led 4-1 late in the second period), but coach Les Larson's crew certainly looks playoff ready now. The Mustangs (21-3-1) are attempting to win their fourth straight section title and third state tournament championship in four years. 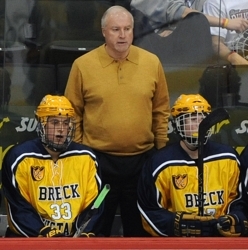 Breck has as potent an offense as any in the state, averaging 7.5 goals per game with three lines who can dent the twine. Mix and match from a group that includes gritty and sly Conor Andrle (23-45-68), Mr. Hockey finalist and speedster Grant Opperman (27-40-67), Thomas Lindstrom (29-31-60), rugged Wesley Iverson (26-27-53), Matt Colford (18-31-49) and freshman sensation Keegan Iverson (13-23-36) and it's tough for any Class A team to match lines with the Mustangs. Larson has been shuffling his lines over the past few weeks to create even more depth, and his top two power play units have been humming at a 44.2 percent clip. No program can hope to shut the Mustangs down, they can only hope to outscore them as Totino recently managed. Breck does have a solid veteran goaltender in Jack Kenney (16-3-1, 2.54, .903) and tough defensemen such as Austin Rudnick (9-16-25) and Ben Tegtmeyer (2-11-13), but has experienced a few defensive breakdowns in those losses. Three straight shutouts against MSHSL progarms to end the season may show Larson has corrected it, though. So does any other program stand a chance against the powerful Mustangs? 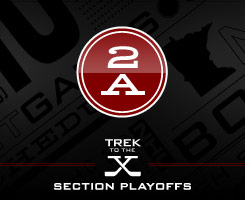 Third-seeded Blake (16-9-0) has traditionally been Breck's strongest rival in both the Tri-Metro Conference and Section 2A race. Before the Mustangs' latest run, Blake qualified for three consecutive state tournaments (2006-08), denying Breck each time. But the Bears were humbled in the regular season finale, 9-0. It may linger as a doubt they can beat Breck -- or as motivation for an upset. Sophomore Spencer Naas (33-20-53) exploded as an offensive force for Blake, while Zach Doerring (13-40-53), Christopher Chute (15-16-31) and Max Harrington (18-12-30) provide plenty of support. Freshman defenseman Johnny Austin (9-27-36) has proven to a be three-zone player who is comfortable rushing the puck. Senior Devon Johnson (14-9-0, 3.62, .870) is a veteran in goal. No. 2 Delano/Rockford (18-7-0) may have the goaltending to shut down Breck, as senior Ryan Pinoniemi (18-7-0, 2.28, .927) is one of the better unsung goalies in the state. He's experienced and broke his own school record for single-season victories. But the Tigers also can score, led by Jack Prinsen (26-15-41) and Dillon McLain (13-28-41). No. 4 Mound-Westonka (15-8-1) is another strong defensive team that allows fewer than three goals per game. The White Hawks have rotated goaltenders David Engel (6-6-1, 2.91, .901) and Andy Seats (9-2-0, 2.74, .892). Hunter Smith (16-18-34) leads the team in goals and points. They'll be challenged by No. 5 Orono (13-10-2), which features one of the top freshman scorers in the state in Gavin Payne (25-28-53) and senior captain Jimmy Lee (24-23-47). The teams tied 3-3 in their final regular season game on Feb. 18. No. 6 St. Louis Park (17-5-3) certainly has had a resurgence under first-year coach Shjon Podein. The Orioles won just two games last year, but improved that mark by an amazing 15 victories in what has to be one of the largest single-season turnarounds in state history. Senior Tyler Brodersen (30-25-55) and youngsters Josh Passolt (21-19-40) and Alec Baer (13-14-27) lead the charge. No. 7 Waconia (15-9-1) will rely on its goaltender, Nathan Kovach (15-9-1, 3.19, .911) to get the Wildcats a few upsets, while No. 8 Providence Academy (9-16-0) has star power in Ryan Tapani (32-18-50) and Marshall Klitzke (16-18-34). No. 9 Richfield (8-16-1) also has a pair of snipers in Mick Dhein (27-38-65) and Tyler Martinez (36-23-59) as does No. 10 Minnehaha Academy (8-14-3) with Michael Fabie (27-20-47) and Ryan Leo (19-19-38). No. 11 Chaska (4-21-0) hasn't been so fortunate, as no player has more than Dan Esping's seven goals for a team that averaged just 1.9 per game. How do you stop the three-time defending section champs? Just when it seemed as if Breck might be vulnerable, the Mustangs went out and spanked rival Blake, 9-0 in the regular season finale. Coach Les Larson's crew has an unprecendented three lines of scoring depth, a power play that's humming along at 44.2 percent, the ability to play either a wide-open or a hard-hitting style of game, and a veteran goaltender in Jack Kenney. When it comes to playoff hockey, nothing can spark a run quite like a hot goaltender. Second-seeded Delano has just the man to put a scare into Breck in the Section 2A playoffs in Ryan Pinoniemi. The senior has played nearly every minute this season for the Tigers and has some big games on his resume, including 86 saves in a pair of close victories over Mound-Westonka and 39 saves in a two-goal loss to Breck.